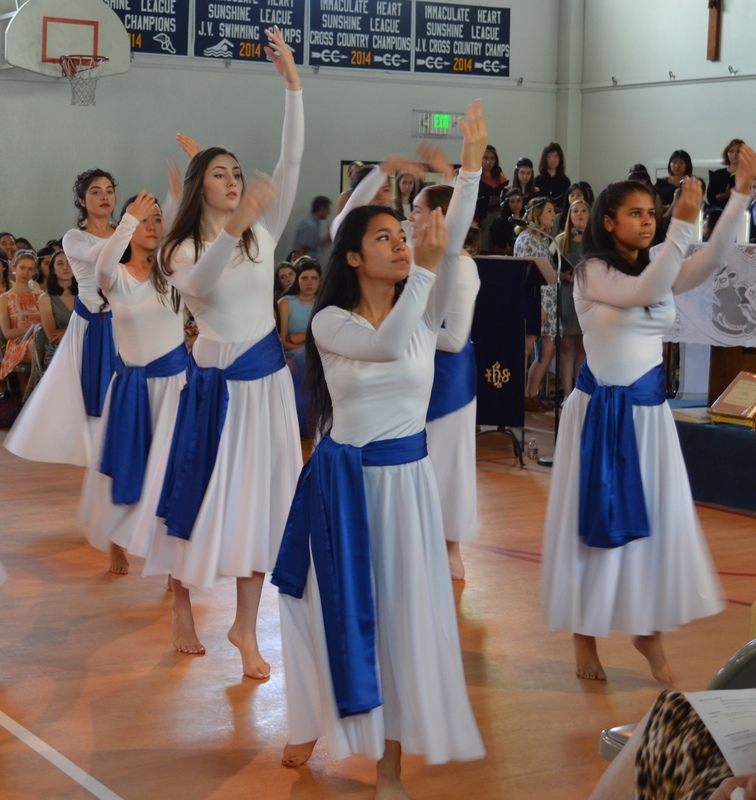 On a sunny first day of May, Immaculate Heart students celebrated Mary’s Day, the most anticipated event of the year, by honoring all women, especially the school’s patroness, through the theme Mary, Called and Chosen. Banners in the auditorium and on the quad paid tribute to the day’s theme through a display of inspiring words by and images of women of great heart and right conscience – from Mother Teresa and Sister Corita Kent to aviator Amelia Earhart and politician Hillary Rodham Clinton to Immaculate Heart Principal Virginia Hurst, IHM, and President Julie McCormick. 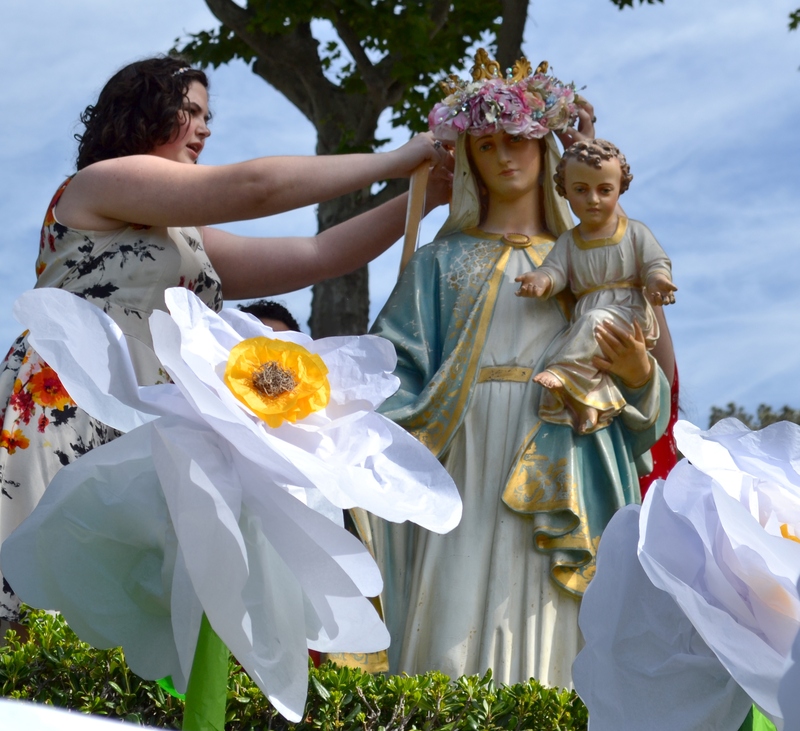 Students, joined by faculty and administrators, later formed a procession to the quad, where they sang “Immaculate Mary” as ASB President Kathryn Teaney crowned the statute of Mary, the mother of Jesus. Then, for the first time in many years, the crowd watched as students grabbed ribbons and danced around a maypole. Students also celebrated the event known as the Great Lawn Dance to the lively music of Dan Sakuduro. Later, the Genesians’ presentation featured stellar performers, including senior Claire Danna, who urged students to follow their passions and not be clouded by the words of society, and junior AjaMaree Smith, who overcame her own stage fright to sing Almost There. Lightening the mood of the audience was the ASB video featuring the reactions of children as they were asked, “What does it mean to be chosen?” As the youngsters responded, every Immaculate Heart girl could not help but laugh as she was reminded of how simple and beautiful the world could be if only people were as innocent as children. 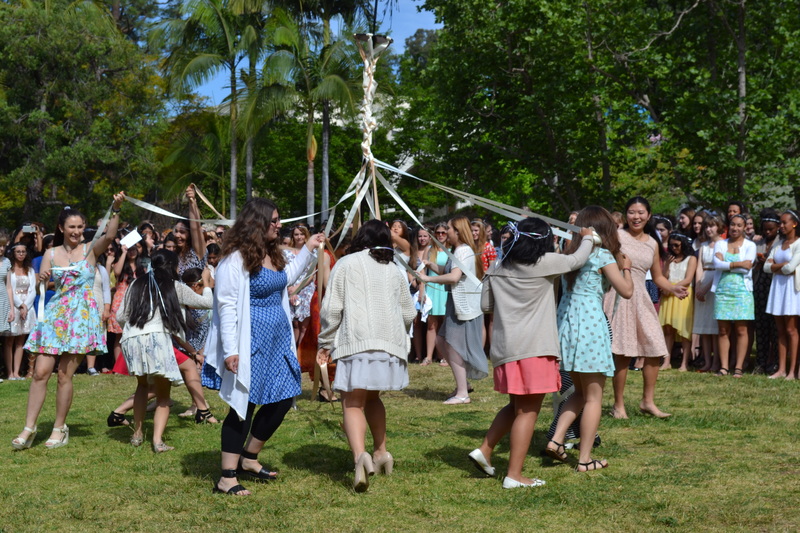 After the day’s formal events, the festivities continued on the quad, where students sat down to potluck feasts and then stood up and danced their hearts out – which is the traditional way Mary’s Day always ends!